What is different about breast cancer in young women? How is breast cancer treated in young women? Inherited breast cancer disorders account for a small minority of breast cancers overall. Genes are the "messages" in each cell of the body that determine the ultimate design of our bodies. Genes can be damaged by the environment. Additionally, people can be born with defects in the genes that remove the body's defenses against cancers. Only in about 10% of all breast cancer cases is there actually a genetic defect that can be tested. This means that 90% of breast cancers are due to other causes. In fact, most cases of breast cancer occur in women who do not have a family history of breast cancer. A complex interplay between environmental and genetic factors affect the development of breast cancer, and all the key factors have not yet been identified. History of radiation therapy Evidence of a specific genetic defect (BRCA1/BRCA2 mutation). Women who carry defects on either of these genes are at greater risk for developing breast cancer. An extended use of oral contraceptives (the Pill) later in life is also sometimes considered a factor for developing breast cancer. However, this is still subject to much debate in the medical community. Diagnosing breast cancer in younger women (under 40 years old) is more difficult because their breast tissue is generally more dense than the breast tissue in older women. By the time a lump in a younger woman's breast can be felt, the cancer often is advanced. In addition, breast cancer in younger women may be aggressive and less likely to respond to treatment . Women who are diagnosed with breast cancer at a younger age are more likely to have a mutated (altered) BRCA1 or BRCA2 gene. Delays in diagnosing breast cancer also are a problem. Many younger women who have breast cancer ignore the warning signs -- such as a breast lump or unusual discharge -- because they believe they are too young to get breast cancer. 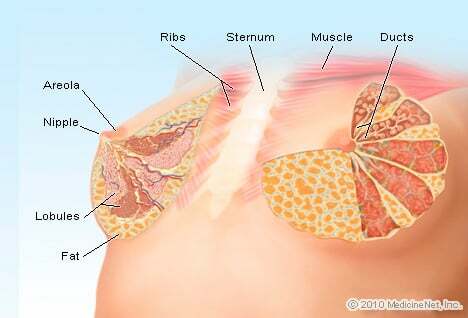 Many women assume they are too young to get breast cancer and tend to assume a lump is a harmless cyst or other growth. Some health care providers also dismiss breast lumps in young women as cysts and adopt a "wait and see" approach. Although breast cancer may not be prevented, early detection and prompt treatment can significantly improve a woman's chances of surviving breast cancer. More than 90% of women whose breast cancer is found in an early stage will survive. When women learn at a young age about the risks and benefits of detecting breast cancer early, they are more likely to following the recommendations regarding clinical exams and mammograms . Young women also need to understand their risk factors and be able to discuss breast health with their health care providers. In general, regular mammograms are not recommended for women under 40 years old, in part, because breast tissue tends to be more dense in young women, making mammograms less effective as a screening tool. In addition, most experts believe the low risk of developing breast cancer at a young age does not justify the radiation exposure or the cost of mammography. However, screening mammograms may be recommended for younger women with a family history of breast cancer and other risk factors. The American Cancer Society (ACS) recommends that all women 20 years of age or older should perform monthly breast self-examinations . The best time to perform BSE is the day after your monthly period ends. Becoming familiar with the look and feel of their breasts offers the best chance for a young woman to notice and change. In addition to monthly BSE, annual clinical breast exams performed by your doctor are recommended for all women beginning at age 20. Annual screening mammograms also are recommended at age 40. Women younger than 40 who have a family history or other risk factors for breast cancer should discuss their risk and an appropriate screening schedule with their health care providers. The course of treatment for breast cancer at any age is based on the extent of the person's disease (whether or not it has spread beyond the breast), as well as the woman's general health and personal circumstances. Treatment options include surgery: either a lumpectomy, which involves removing the lump and some surrounding tissue, or a mastectomy, which is the removal of a breast. Radiation therapy is generally used following a lumpectomy, and chemotherapy and/or hormone therapy often are recommended after surgery to help destroy any remaining cancer cells and prevent recurrence. Breast cancer poses other challenges for younger women, as well, such as sexuality, fertility and pregnancy after breast cancer treatment.